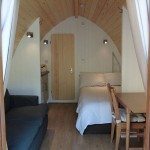 ‘What is a Camping Pod?’ You may ask. 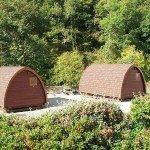 Some camping sites offer what are known as Camping Pods. These are tiny log cabins, some offering nothing more than a carpeted floor and an electric point. 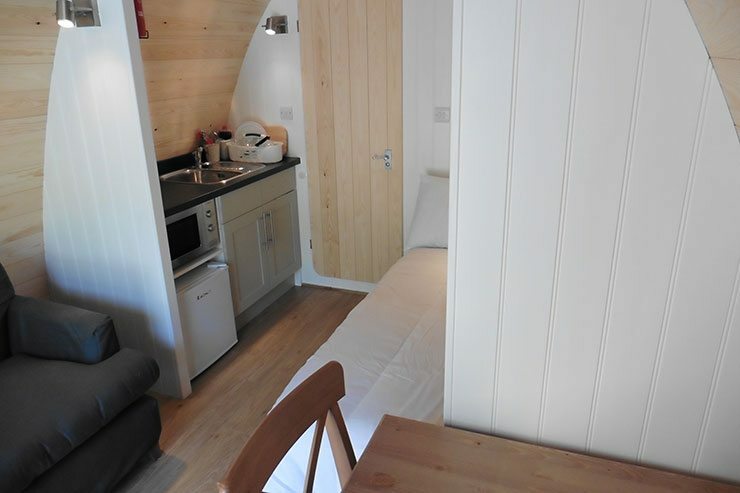 Equipped for two people, they have a shower room with toilet and basin, full size double bed, sofa, TV and dining table. They don’t have full cooking facilities but do have a kitchen sink, microwave, a small refrigerator, toaster, kettle and enough dishes and utensils for your takeaway or microwave meals. 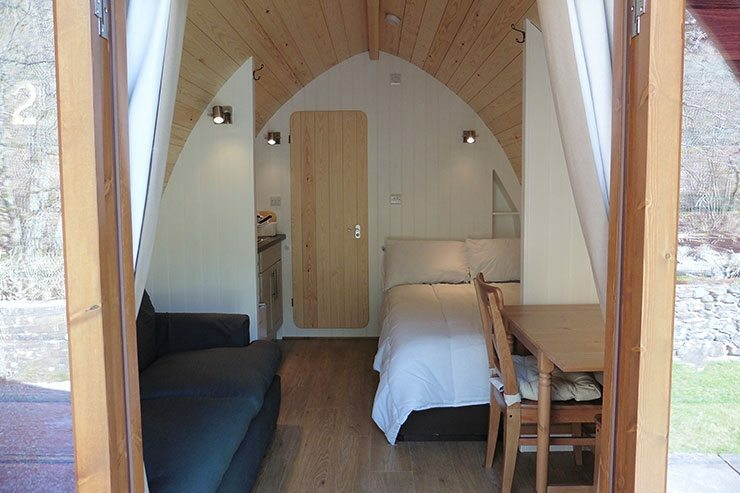 Please note: The use of camping stoves inside the pod is not permitted under any circumstances for safety reasons. 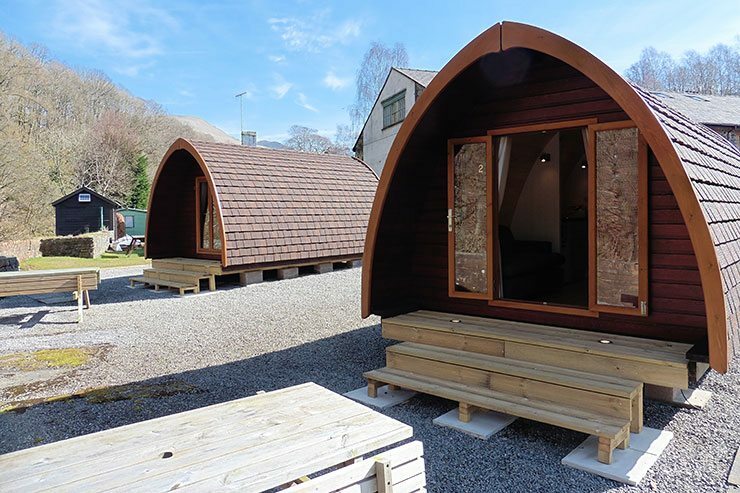 The Pods are heated by an electric panel heater. 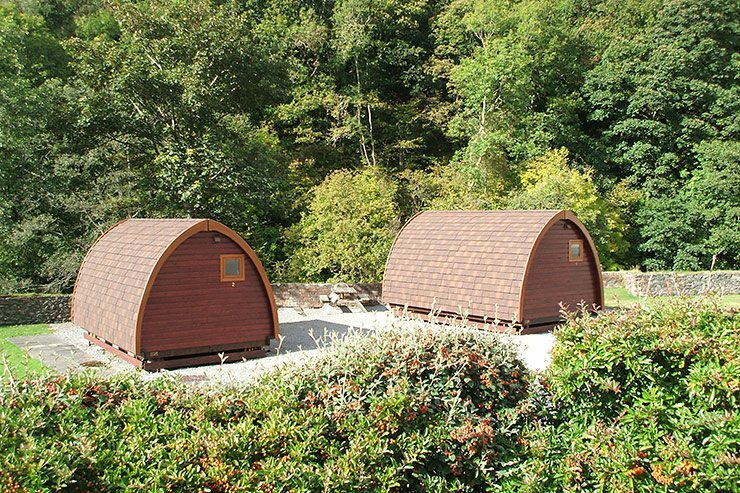 The Pods are located on the river bank and have a picnic table and barbecue stand. To keep costs down for you, we don’t charge for electric within the rental price. Electric is provided by a coin meter that accepts pound coins, so you only pay for what you use. 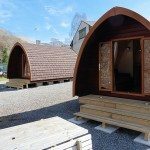 Also to keep your costs down, although there is a double duvet and four pillows, we don’t provide The Pods with bed linen. Please bring your own linen and towels. 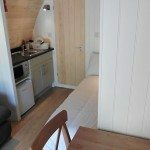 So there you have it, a compact, budget property in a superb riverside location, equipped with everything you need for a great stay in the lakes. 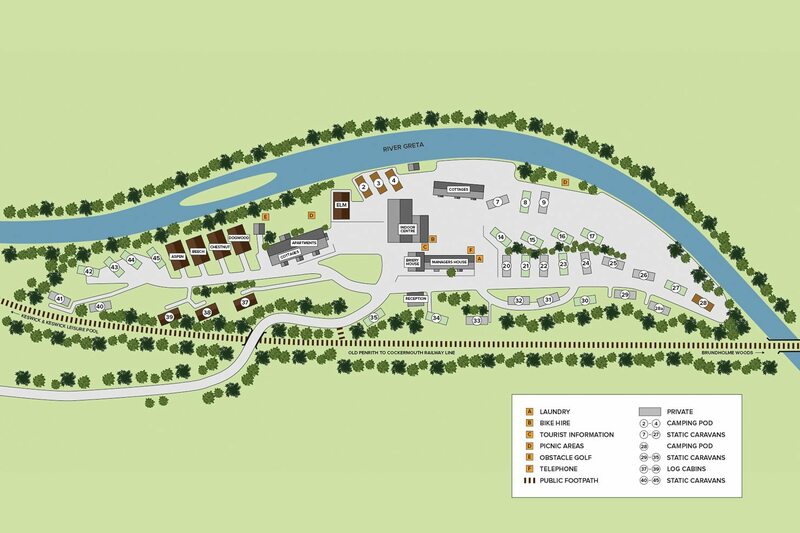 Use the park map to see the location of our Keswick camping pods. Hover on the image to zoom or download pdf. Cancellations can be accepted as long as at least 1 month notice is given before your due arrival date, in which case a full refund will be given less a £25 cancellation fee. If you cancel within 1 month of arrival date, then the full amount for the holiday is due and is non refundable. Please note that deposits on cancellations for reservations for the Christmas and New Year periods are NON REFUNDABLE. Unless otherwise stated in the property description, adult house-trained dogs are allowed on condition that when booking the owner guarantees that in the event of any damage he will accept responsibility. Puppies are not welcome. Maximum two dogs per unit. A charge of £20.00 per dog per week is required. Dogs must never at anytime during your holiday be left in the property on their own. The property must be left clean and undamaged. Dogs must not be allowed on seats or beds in the accommodation. Please bring a mat or something similar for your dog to lie on, as soiled carpets will be charged for. For the comfort of future guests, there is a very strict No Smoking policy within all accommodation at Low Briery. Possession of all properties will be available from 3.00 pm on day of arrival and properties MUST be vacated by 10.30 am on day of departure. Please notify in advance of your estimated time of arrival. Please ensure you have read our full Terms & Conditions before proceeding with your booking.